Share these delicious southwest inspired Chipotle Butternut Squash Deviled Eggs and delight friends and loved ones. If you follow me on social media or regularly read my posts you know how much we support our neighborhood farmers market. There is no joy like strolling through bins of fresh produce early in the morning, still glistening with dew, with the smell of fresh-baked goods lingering in the air and hints of classic rock tunes reaching your ears. It is a kaleidoscope of sights, scents and sounds. There is something about knowing the folks who work hard to produce the food we love. I grew up in a rural area in Illinois where farming was a predominant lifestyle. If you didn’t actually farm chances were you worked in a farming related industry. For years my family purchased a side of beef that was stored in the basement deep freeze. We picked up fresh produce from roadside stands and it wasn’t unusual to get homemade gifts of canned goodies straight from a neighbor’s root cellar. And don’t forget the holiday parties with Rubbermaid containers filled with dishes made from family recipes handed down of generations! It has been important to me for the kid to have a similar exposure to folks who farm. Things are a lot different though, it’s 25 years later and we live in a big city where convenience is no longer a luxury but an expectation. 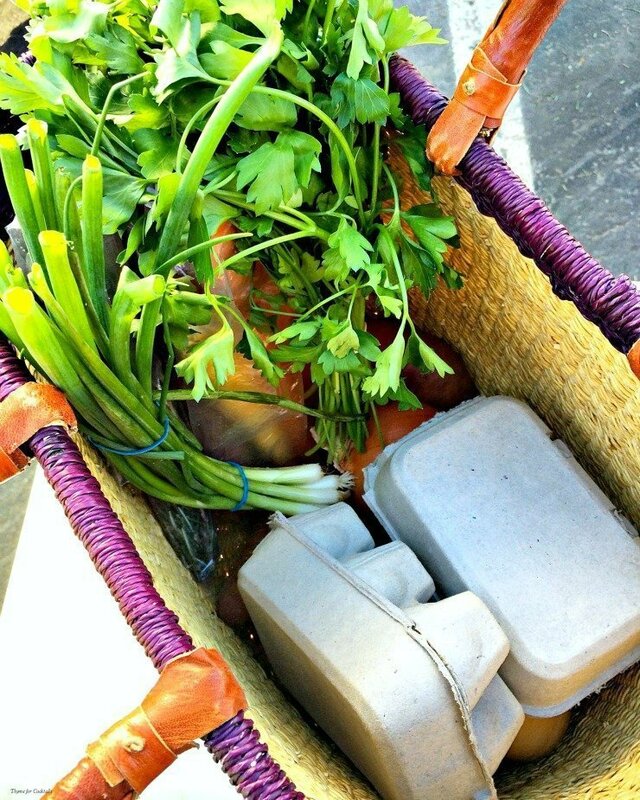 The farmers market is our oasis in a storm of take-out and drive thru meals. For me it is a place to mingle and meet, find inspiration, gain foodie knowledge and to give back. The first time I made a dish to share with our market friends I was nervous and intimidated. They work so hard and I wanted to do justice by their ingredients. I think it was salsa that first time and you should have seen the delight we received! All the vendors were touched that we wanted to share our creations with them. Since then it has become a habit to drop off homemade recipes using our market fare. Eggs are one of the most sought after items at many farmers markets. I know vendors who will sacrifice having them on their own table so they can sell them at the markets. There is nothing like the delicious, richness of a farm fresh egg! 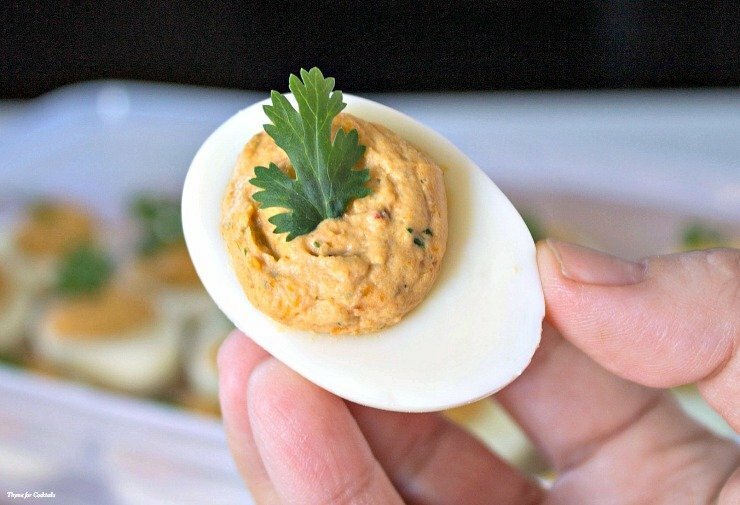 When I managed to get my hands on an extra dozen recently I knew deviled eggs would be the perfect thing to surprise everyone with right around the holidays. Leftover roasted butternut squash adds heartiness, while chipotles and sour cream give them a tangy kick. A dash of cumin and cilantro add to the southwest flavors! 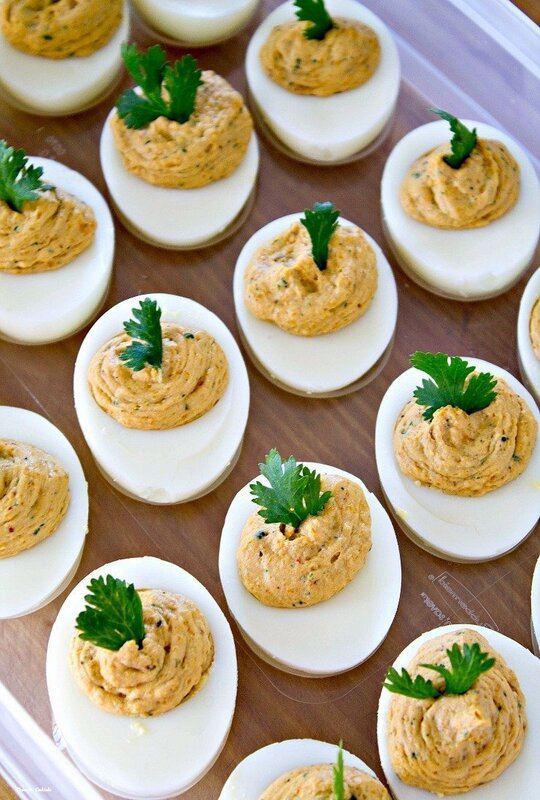 I was never a fan of deviled eggs as a kid, they were just too weird. Plus I have never liked mayo heavy dishes. 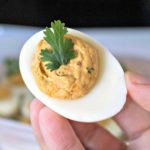 In the last few years I have been making them for Paul, but with a twist we all enjoy like these Chipotle Butternut Squash Deviled Eggs. They still freak me out a bit, probably because I am always afraid of messing them up, but I have learned a few tricks to make things easier. 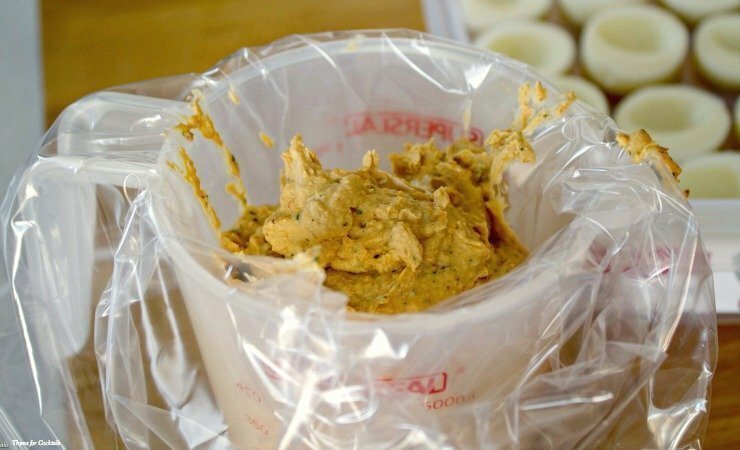 One thing is to put the filling bag (you can use a pastry bag but a large plastic storage bag works just fine) in a measuring cup with the corner I am going to cut in the bottom, then fold the edges of the bag over the sides of the cup. It helps from getting filling everywhere! We had such a blast walking around, sharing these delectable goodies with our favorite vendors. It always feels good to give back, especially with the gift of food, knowing we all had a part in creating it. I had several folks request the recipe and even more that gave me ideas for new variations… Can you say buffalo blue cheese deviled eggs! Tells us in the comments your favorite recipe to share with friends, loved ones and even strangers! Place eggs in a large heavy bottom pot. Add enough cold water to cover the eggs by 1 1/2 inches. Partially cover and bring to a rolling boil. Cover and cook 30 seconds. Remove from heat and let sit 13 minutes. Removes eggs and place in ice water to stop the cooking process. Remove and disgard egg shells. Cut eggs in half horizontally from tip to tip. Remove yolks and place in a bowl, set whites aside. In a food process add butternut squash and pulse until roughly chopped. Add remaining ingredients and pulse until smooth. Adjust amount of sour cream to reach desired consistency. Garnish with a sprig of cilantro and serve. Thanks Jenna! We had so much fun with this recipe and everyone loved them! 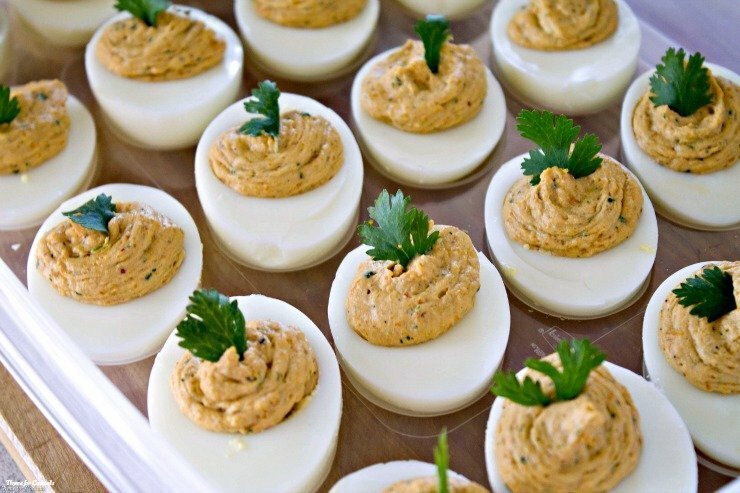 Those deviled eggs look divine! Pinning in Ahalogy. 🙂 Nice to meet another SoFab influencer!